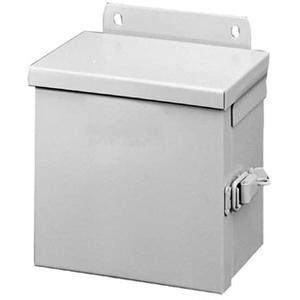 Hoffman Small hinged cover enclosure features durable 16-gauge galvanized steel construction with ANSI 61 gray polyester powder-paint finish. It has drip shield top, seamfree sides, seamfree front as well as seamfree back for protecting against rain, snow or sleet. It measures 6-Inch x 6-Inch x 4-Inch. Weld nuts of this enclosure support mounting optional panels. It has plated steel hinge with stainless steel pin. It allows padlocking on zinc-plated draw-pull catch. Knockouts on bottom of enclosure provide space for accommodating cables, connectors or conduits to meet user requirements. It includes white solid panels and optional gray perforated panels. It offers basic functionality requirements for applications that require protection from rain, sleet, snow or dripping water. Hinged cover enclosure is UL listed, cUL listed, NEMA/EEMAC certified and meets IEC standards. * Inventory displayed is accurate as of 04/19/2019 09:40 PDT.